My vacation officially started Friday at 3:30, but now I am on full vacation mode. Not doing anything special, visiting family and doing errands I can't do while I'm working mostly. But I am liking the waking up whenever I want. Sadly, I am still on work mode, so I got up at my usual. I thought this week off would be a good time to change up my diet. More protein, not really concerned with fat, and being more careful with carbs. Refraining from white flour, white sugar. Stuff like that. After taking Ford out for a walk at Children's Park, I stopped by Fairway for breakfast/snack. 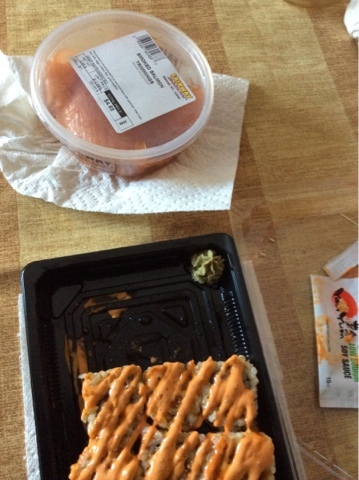 Currently eating smoked salmon trimmings and a spicy tuna roll with brown rice. Not bad, although I scraped most of that mayo stuff off. Green tea to wash it down. My mom wants to get sushi later. Can't say no to that.